As Fi mentioned in an earlier post my sisters and I made Christmas presents for each other this year. I had so much fun doing this, it’s great to have an excuse to do something crafty. 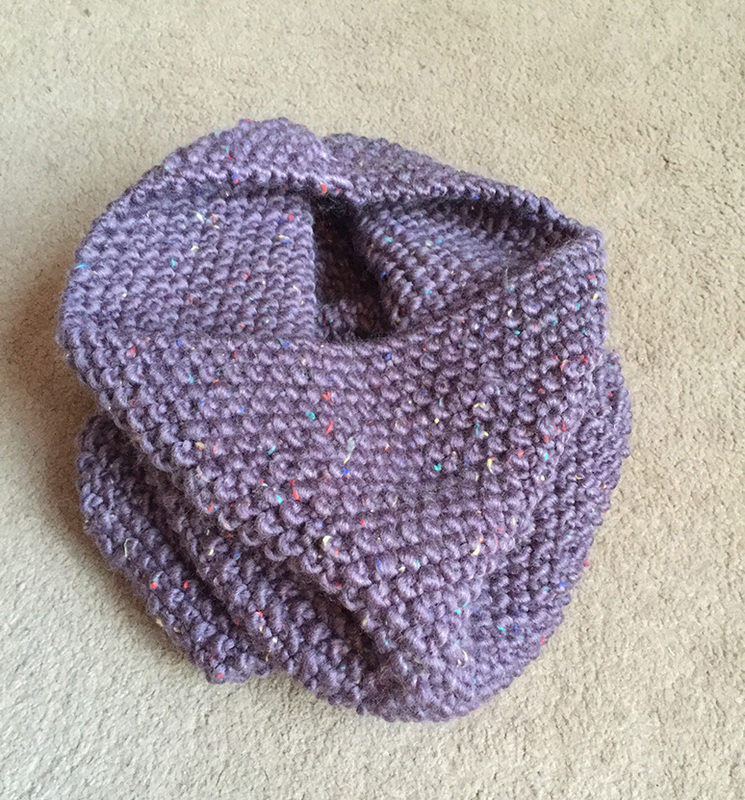 Today I’m sharing the gift that I made Becca – a knitted snood. When we agreed to get crafty I knew straight away that I wanted to make Becca a knitted snood. She’s currently studying in Sheffield and it’s cold cold cold up there. With that in mind any extra layers are always welcome. She already has an amazing long red scarf with enormous pom poms, so I settled on a snood for her instead and went on the hunt for a pattern. Luckily I remembered that the lovely Michelle over at Life Outside London had blogged about making a snood back in August. I quickly searched out that post for some inspiration (read it here) and after seeing her finished snood in moss stitch decided that I had to give it a go. I just loved how it looked and I knew that Becca would love it. I picked a purple wool for the knitted snood and then adapted Michelle’s pattern ever so slightly. I decided to ignore the twisting element and just stitched together the two ends to create the snood. I also made my rows 45 stitches long as I wanted something a little wider. This meant that I used almost 5 balls of wool and I felt like I was knitting forever. Fun fact: I was on Oxford Street buying wool on the 22nd Dec and then knitting on the 23rd, nothing like cutting it close! I really loved how this turned out and I’m so pleased that Michelle blogged about her snood. Otherwise who knows what I would have knitted instead! Even more importantly I think Becca liked it too, she ended up wearing it as soon as she’d unwrapped it.